Hot Chicks Dig Smart Men: Hmm...Nachos! We're going to go see Hellboy II this morning. I loved the first one, and I hope the second lives up to its hype. I'm a fan of Ron Perlman, and I thought Pan's Labyrinth was simply brilliant (and more than a little disturbing), so I'm optimistic. After that I'll be dinking around, doing chores and such, so have a nice Sunday in my absence! Should I understand from the title that you intend to eat Nachos at the movie theater? with that unholy cheese-like substance that isn't really food? Please! I beg of you! Noooooooo! Nathan, that's a quote from the first movie. That Unholy Cheese makes a great addition to baked macaroni and cheese. In another life, when i was a short order cook, i used to get the GIANT cans of it, and used to to beef up the homemade mac and cheese that we were then living on. It's like orange melty salt. Nathan, seeing as how I'm having that-time-of-the-month stupid cravings... orange melty salt sounds yummy right now. Luckily I've been content so far with three quarters a container of guacamole followed later by Ben & Jerry's. I loved this movie. Love, love, love. It combined the visual interest of Pan's Labyrinth with the smart-alecky goodness of Hellboy. Ewww, I am a food snob who doesn't do fluorescent processed cheese stuff. Plus I'm not a huge salty food person. Real nachos, though, made with tortilla chips, beans, mexican ground beef, chiles, pico de gallo, melted colby jack, with guacamole and sour cream... mmmm. Definitely mmmm. Dammit, now I'm craving them and hub can't eat them. Jeri, I'm an equal-opportunity nacho-lover. I'll eat the orange melty salt variety, hereafter known as "food pr0n," or the tasty, tasty alternative you describe. There were about 5000 12-year-olds lined up for Hellboy II. I'll go see it when it's been out a while. Nathan, that's why we go to the first show of the day (in this case, 10;15 am.). The teens aren't really out in force yet, and the tickets are much cheaper. Seriously, we enjoyed it too. I particularly liked the darker hints, I think they're more true to the underlying story. Hellboy is such a great character. Speaking of Hellboy, I've been on the fence about picking up the comic. Having neer worked at a comic shop, but thoroughly enjoying comics, I'd say you should definately check out the Hellboy comic. 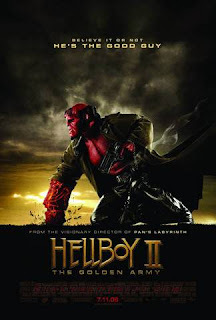 I've read maybe half the series, and the movie (at least the first one, can't wait to see #2) does a good job of staying true to the Hellboy character and themes. I'll have to check out the animated series.